The subject of using or not using protective lenses can invoke heated debates among photographers, with both sides often fiercely defending their choices. I am not going to debate whether it is right or wrong to use protective filters – that’s certainly a personal choice. I have been using them for a number of years now to protect my higher-end lenses and make it easier to clean lenses with recessed front elements (such as on Nikon 50mm f/1.4G / f/1.8G). 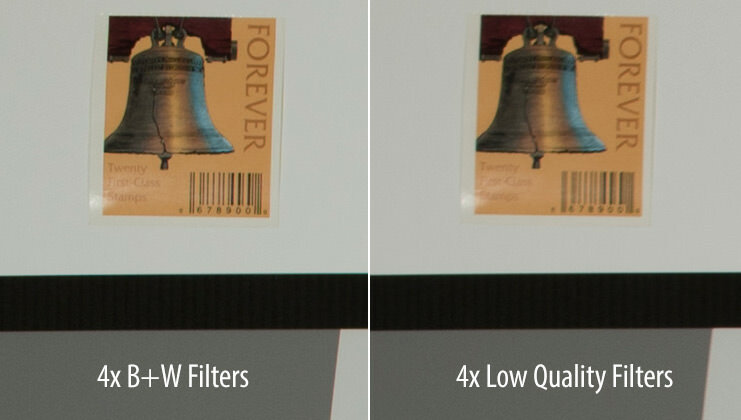 Having had bad experience with purchasing a low-quality no-name brand filter when I just started photography (it was sold to me as a “must-have” at a local photo store), I learned what such a filter can do to my photos the hard way. Since then, I have only been purchasing multi-coated B+W filters that use high-quality Schott glass. I have been very happy with these filters and have been telling our readers to either use the best they can find, or not use filters at all. As you can see, the B+W filters had no impact on image quality. The differences in numbers between “No Filter” and “B+W” you see above are within the margin of error. 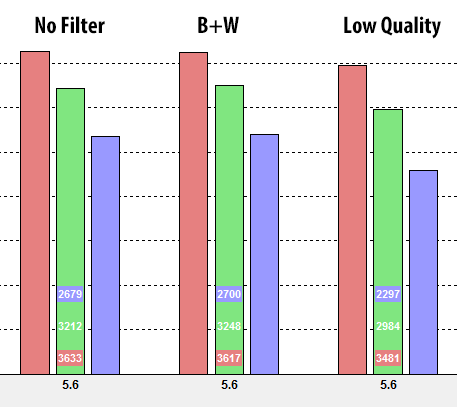 However, if you look at the third graph, it is pretty clear that the filters that I was testing were of low quality. There is a rather significant drop of approximately 5% in the center frame, a drop of 7% in the mid-frame and a pretty significant drop of close to 15% in the corners. To make sure that I was not making any errors, I re-ran the test several times and used completely different sets of filters from the same manufacturer (I had a total of about 20 77mm filters that manufacturer regarded as “high quality”). Other batches yielded similar reduced numbers, some worse than others. As you can see, the difference in sharpness is pretty clear – lower quality filters certainly result in visible image degradation. Details are blurred and the straight lines are no longer sharp. And this is just sharpness alone. If I shot with the two in a high contrast situation (say shooting against the sun), I bet the low-quality filters would introduce all kinds of artifacts to my photos. Yes, this is a rather extreme example and I know that nobody would stack 4 filters like I did above. If one were to look at images with a single filter, the differences would be very minimal. However, that’s not what I am trying to show here. The point of the article is to show that high quality filters have no effect on sharpness and do not necessarily reduce image quality, as some photographers claim. It is certainly the case with lower quality filters though. The only thing that filters might introduce to images, is more flare and ghosting when shooting against a bright light source. In those situations, it might be best to remove filters altogether. Lastly, keep in mind that the filters I tested were regarded as “pro” filters. If you are curious to know what a single cheap / bad quality filter can do to an image, see this article that I posted last year. I run Nikon filters on all my lenses, the only exceptions being my Nikon 8mm f2.8, 16mm f2.8 and 14-24mm f2.8…. These lenses do not except front filters . My 300mm 2.8 AF-S, 500mm F4 AF-I, and 800mm f5.6 all have the factory fitted glass plate to protect the big glass in these lenses. It would very much definitely be of interest to us, as I use either B+W Nano or Hoya HD filters, depending on availability of either brand. I only use either of these brands because I think both B+W Nano and Hoya HD filters are indistinguishable in transparency and quality but your test should be able tell it all. Anyway, I think this is a burning question for many of us who use filters. My Nikon 8mm f2.8 ( fish-eye ) has no provision on the front for filters, and has the filters ” Built into the body ” L1BC, R60, O56 , Y52, Y48. That would be very interesting Nasim! Thanks for the information sofar. I always wondered, but it seemed silly to save on a ‘cheap´ filter after purchasing an expensive lens… It is an extra expense but worth it apparently! It would be great indeed! I’ve just bought my first ND and CPL filters, and my choice fell on a couple of Haida Pro II Slim, which are made of multi-coated Schott glass same as B&W but with a much cheaper price. Always nice to see tests, just thought I’d share this previously published one for comparison. yesterday the link would not open for me, tried it a few minutes ago and now it works, anyways its an interesting test on that web site, I have to order my filters online, I live on an island, there are no camera stores here, I have been using the better quality Hoya UV filters, I think the test demonstrates that they are acceptable. Many years ago (in film days) in another place I worked in a camera store, we were encouraged to sell UV filters to all of our customers, the markup was high, where as the mark up on bodies and lens was not so high. I guess I came to believe my own sales pitch! Yeah UV filters can be hit or miss and they are DEFINITELY used to up-sell products and make extra revenue on a small-profit sale. I have a lot of cheap crap from buying camera equipment. After reading some comments and the article I think I’ll take them off a few lenses for a while though, see how things go. Did you notify the “Low Quality” company of your test results and did they respond? What is the name of the “Low Quality” company? Interesting article, not a total shock to learn that any addition to you lens has the potential to degrade image quality. I recently changed my body and my walkabout lens with the aim of improving IQ so a valuable lesson learned. I guess I will continue to use my Hoya HRT Circular Polarising & UV (combined in ONE) filter, plus my Cokin Grad fitler while shooting land / seascapes. I’ve been using the amazing Canon 500D close up ‘filter’ for macro but have recently switched to using AF enabled extension tubes, and there is an improvement even over the double element 500D. Apart from those few exeptions I have never used filters, and like Nasim says, anyone you talk to in a proper camera store will convince you to stick a UV filter on the front of the lens. This culture developed from the days of Film SLR cameras, where the film itself was the limiting factor to image quality. You wanted the best, then Kodachrome 25 was it! With other film providing varying levels of image quality, plus the process of printing images demanding yet another lens – the enlarger lens this time – the very minor effects of a solitary UV filter were indiscernable to all. We were also advised that at least, if something were to happen while using the camera, the UV filter was also a layer of protection to the front lens element. I rejected the use of a UV filter, and determined to care for my gear very carefully. I can only recall one instance where this strategy failed. A bunch of strangers, myself included, back in the 80’s answered a ‘model studio beginner’ advert. There were about six of us and two models, all the studio flash facilities, a very interesting introduction indeed. One photographer, half way through the two hours, was dismayed to find one of his lenses was damaged. When he showed me, there were scratch lines on the front element, as if someone had taken a nail or a screw, and deliberately damaged it. I asked him if it had happened at the studio, but he honestly couldn’t remember checking the lens since it was last used elsewhere – it was horrible to see, and I felt for him. Apart from that, I have never seen anyone damage – or have damaged – a front element. That issue aside, now we are in the world of ever higher resolution bodies AND new lenses being introduced to supply the IQ that they need – I guess it was only a matter of time before IQ reached the point where we CAN see the effect of filter use upon it. While it’s interesting that if you try hard enough you can measure differences in how much filters reduce sharpness you really need to look into measurement protocols for contrast, coma and ghosting. These are the areas that are optically interesting with filters. And their handling (eg ease of cleaning, resistance to scratches and resistance to the threads sticking with other filters) needs evaluation too. Using an Imatest with filters is a bit like the idea that once you have a hammer everything looks like nails. Hats off Nasim! You have done a great job. Now, I do not mind to spend a few more bugs on a good quality filter. Nasim, I wonder why not any lens or filter manufacturing company introduce nano coating filter for our non-nanocoating lenses? Is it possbile? Why aren’t UV/lens filters reviewed like lenses? Where are the websites that do this? Plenty of websites review multitudes of lenses from a near infinite number of sources/manufacturers… here seems an opportunity for somebody to make a name for themselves and also serve the community and have their thanks for doing so. Have you seen it? I found it interesting and comforting, considering that where I live all we can find are a few Hoya and Tiffen, about a 300km drive away, and we cannot even dream of B+W. What do you think of their conclusions? I’ve been using B+W filters ever since I came across your site. A few months ago I slipped in the snow and my D610 with the Nikon 24-70 f2.8 went flying. The lens hood shattered and the filter had a huge (1/4 inch square) gouge in the center. It cost a little over $100 to replace the filter and hood, but the filter saved my lense. Every time it buy a lens I buy a B+W filter for it. Like some others, I have always used Nikon filters for my Nikon lenses, thinking that Nikon would do us no wrong. Will be interesting to learn the results when Nasim will post his filter multiple brand filter test results in the near future. Years ago I used to hunt. Take my little Leica 10X25mm binoculars, fit into my shirt pocket. My guide had new Steiner 7X50mm German Marine-Tactical binoculars.My 10x25mm Leica had better dawn and dusk light gathering capacity due to the coating and quality. Half the diameter, much greater magnification. I thought impossible until I looked through his new ones. Mine were already a number of years old. Circa early 1980’s and still optically supreme today. Compare any binoculars and price usually indicates quality. German and Austrian glass rule the optics world. German lens coating on binocular optics increases light gathering, clarity, etc. From what I have read, I thought Canon and Nikon use one of the big filter manufacturers in Japan to label their product as Canon, Nikon…… aren’t you using Cokin or Hoya or Tiffin labeled as Nikon, Canon? I always use B+W or Heliopan. If I cannot afford the proper specialized 77mm, I go filterless….i.e. I always use a protective UV type from Heliopan or B+W. If need a fancy one, I wait. Nasim, interesting review and test image. I am also one of those who don’t use a front filter on my lenses except for special assignments. Most of my professional work is done indoors in an operating room or studio. I’ve always taken extreme care of my equipment. However, when assigned to make forensic photography for law enforcement or one of my lawyer clients I will, depending upon location and circumstance, use the B&W Nano clear filters to cover the front element. Back in the film days I always used a UV or Skylight filter. It seemed to be the norm at the time. When I retired from the U. S. Army, and went into full time photography I was still shooting film until the early 2000’s when I switched to digital and a good friend informed me that the filters really did nothing with regard to digital except protect the front element of a lens. He insisted I look into better insurance for my equipment and I did just that. Now were I an outdoor, wildlife or sports photographer I perhaps would still be using filters to cover my lenses but these are rear occasions for me so I don’t. I have been fortunate that in over 40 years of shooting both in the service and as a civilian I have never had an incident with a front element. Not even during the Viet Nam War. The only filters I use on a regular basis are CPL’s and ND’s of various kinds. extension one puts on the front element of a lens, no matter how good, could cause some kind of aberration and I always look to avoid that. Thanks Nasim for an article who’s subject has been much on my mind of late. I shoot Nikon and when I buy lenses I just usually add on a Nikkor NC for protective use only. 70% of my work is in the studio where I don’t use a filter but when I do get out and about I always screw on a filter. Recently, taking advantage of Nikons lens sales I expanded my lens set with some zooms (budget F4 variety.) The company I bought them from included free filter sets called Pro-Optic. Does anybody here know anything about these filters or who even makes them? I cant seem to find any info on them. Any info anybody has on this would be much appreciated…..and yes, of course, I full well know that there is no such thing as a free lunch…Thanks. Winston, I’m thinking the filters you describe that you got for free might be a proprietary brand made for that store to give away with a lens or camera purchase. B&H does the same thing with a brand called Lumensque and claim to be the same as Schott glass filters with 12 times coating. I’ve never used one so I don’t really know the quality but as you state….there is no free lunch. Oh for sure third party manufacturers making propitiatory filters for a host of camera gear vendors. I wouldn’t be surprised if it wasn’t the same manufacturer making the same filter for both the mentioned brands much like a canned corn company making 16 different store brands of corn for 16 different grocery stores across the country..and each brand probably all the same or close. I was just wondering if any one had noodled who that filter maker was. It would probably be easier to get the NSA to come clean then to find out that info…Thanks. Winston, had a good laugh at your analogy and comment regarding the NSA. I’m sure you are correct regarding some filter manufacturer making a variety of the same filters under different names. When one looks up Lumensque on the B&H site the three filters, two UV and one CPL are listed “Not for Sale”. These are given away as a premium with certain camera bundles or lenses. Nassim, I think U$70,00 on one translucent glass filter is a ripoff. I really don’t how to afford such price tag for UV Filters. It would be really good to see the comparision between this B+W and cheaper filters like the Hoyas and Tiffens. They are knows for budget good quality, I’m now very curious to see if there are significant differences between them. Ricardo, think about it. If a $70.00 filter is, in your opinion, a rip off, what would you do if Nasim wrote that only the $200 filters were any good. I think you really need to look at your work and judge for yourself if the results are good. If you think they are, they are for you. That is more important than running out to purchase hundreds of dollars in filters just to protect the front element of your lens. I don’t know if you are in the US or elsewhere but I’m sure a good insurance policy might be what you need to look into. These clear filters do not enhance our photography, they only protect the lens. Now if the discussion comes to CPL or ND filters we have a different discussion. I too would be interested to see a similar test with Nikon Neutral Color filters. 1.) What is the difference in Imatest results when comparing one filter? That is what we normally use. 2.) How much of this difference is due to the nano coating on the B&W filter? I prefer B&W MRC nano coated filters and use them on several lenses. However, I have had great results with Marumi Super DHG filters, which have Marumi’s nano-equivalent coating. The cost is still expensive, but significantly less than B&W. Thank you for taking the time to prove the (expected) negative impact of cheap filters on lens sharpness. But you stacked 4 of these filters to get this result! I can’t think of a practical situation where 4 filters are stacked. May be 2, one ND and one polarizer, but 4? What I’m eager to know now, is there any significant difference between one high quality filter compared to one cheap filter? Yet again amazed at your dedication and efforts, to test out gear. Thank you. Don’t like straps nor filters. Anyone not seen the reflections coming off a lens wearing a filter? All that is light going the wrong way. The SIC nikon coatings look so efficient, why ruin the effect (unless of course you are mountaineering, or maybe a bug that can see these wavelengths)? As regards the safety “must fit filter”. Really? I smacked a super-wide lens on a chimney/roof top scramble, and failed to see the image degradation despite the resultant hole being over 1mm deep (centre lens). It was the other safety feature, the strap, that caused this good swing at sharp concrete corner of chimney breast. Never since used a strap, better to have a good hold and use the lens hood which is doing a credible job in any case. The filters must, surely, be incredible. Look forward to and appreciate your forthcoming tests, thanks. This was a nice little test – for as far as it went. Imatest scores are but one part of the degradation of using filters. There are other things like AF focus shift – especially with telephoto lenses shot wide open – not to mention flare, ghosting, contrast, and color cast. You do not say what focal length lens you used or what method was used to focus. ……… If you want to “protect” your lens without a filter, get an appropriate round lens hood – preferably metal – and leave it on the lens 24/7 and cap it when not in use. This will necessarily cause you to have a bigger case to accomodate the hood being left on. A year or more ago I read a story about a camera store that, as part of its business, rented out lens and took in trade-ins. In any event over the years the store ended up with a large box full of used filters. The staff, out of curiosity, over this same issue of the difference between inexpensive and expensive filters put, if I remember correctly, 8 low priced UV filters on a lens and took a shot. Then removed the low cost filters and stuck on 8 expensive filters. I think there were a mixture of brands, but the difference was one group was inexpensive the other expensive. Then took the same shot. They posted both images, the difference was like night and day. Of course the expensive stack of 8 filters provided a much better image then the shot with the low cost filters. It was a fun story to read, I mean who would put 8 filters on a lens? Well Nassim put 4 on…was there some images we could see? Great topic Nassim! I used to put a UV filter on every lens, but at night the internal reflection was just too much and I was constantly taking them off. finally I took a look at all my filters and realized they were all free of any damage, and that by being careful I wasn’t putting neither filters nor lenses in any harm’s way, so I stopped using UV filters and have never had any damages. This is an important question and you have answered it more clearly and thoroughly than I have ever seen done before. Thank you. You are setting a new standard for reporting on photography. While at the end of the article you clearly state that “the point of the article” might be “to show that high quality filters have no effect on sharpness and do not necessarily reduce image quality, as some photographers claim”, the article in general, when considered with the illustrations, seems to be written down and gives the impression that low quality filters and the one you tried in particular have adverse effect on sharpness and reduce image quality. In other words, although you make your point, IMO you have inadvertently and/or implicitly made another point that low quality filters have adverse effect on sharpness and reduce image quality. In this context, if you had compared the B&W with the other filter you were provided without stacking (a realistic scenerio) , you might have reached a result where there is no or just negligible difference, even in high contrast conditions. After all this is what would matter for the majority of the readers. D0 you really expect me to believe that 4 filters are going to produce a better IQ than the bare lens like your chart indicates – nice try to dupe the novices, but I don’t think so. This reads like an upsell for B+W. This all removes all credibility of your reviews. I think that’s why the article refers to the difference being within (Imatest’s) margin of error. So what is the verdict? To use a UV filter or not to use a UV filter! Common sense says why put a piece of glass in front of your expensive beautiful lens! Unless it does something to enhance your lens and your picture. My 2 bits about common sense! But does it answer the question? It appears to me that reading the entire thread answers you question. If you want to use a piece of extra glass in front of your lens that does not interfere with you photography do so. If your looking for a rule here I don’t think you’ll find one that is hard and fast for every photographer. BTW Mickey, I agree with your common sense. I’m one who doesn’t think it is a good idea to put another piece of glass in front of my lens unless it is going to get me an effect I’m looking for. For me, shooting in the studio I take the filter off but while out and about doing location work or landscapes/wildlife shots I leave the UV or ND filter on for protection. I thought the big take away from this thread was which brand of filters were best and I don’t think that has been conclusively answered yet. I agree, if you are shooting outdoors under certain adverse conditions it’s best to leave the filter on. I bought a Tamron 70-300 and was looking at which filter to buy. I decided on the B&W. But if you look at the lenstip chart, you will see that the 2 best UV filters are Hoya. One costs around $40 and the other about $80, which I think is HD. So which one? Hoya or B&W? Would love some input! Filters are always an interesting topic, I have seen a few web sites with lengthy discussions on this topic and your experiment was conducted several years ago, it was by a fellow who works at a camera shop if I remember correctly. Still an interesting topic, and a good experiment to stack the filters like that. Personally I do stick a clear or UV type filter on all my lens just to protect the front lens glass and if I get mud or sea spray on the filter its far cheaper to replace the filter. I have tried B+W, yes, good glass. I’m not a professional photographer, never make a print bigger than 8X10 and typically I am taking pictures of my grandkids and some scenery on trips. I suppose there are a few others who could identify with my photographic style. So having said all of that I have some B+W filters but mostly I use the Hoya multicoated filters. I have Nikon DSLRs and some Olympus Pens. Recently bought a B+W filter for the Olympus, a 37 mm UV. Interestingly the thread on the B+W was cross threaded to all of the Olympus MFT lens that take the 37 mm. I eventually tossed it out. On the Hoya multicoated fiters, also in 37 mm, I got some grime on the filter so got out some lens cleaning spray and lint free cloth, it appeared to take the multicoating right off the filter. Had permanent streaks after that. I had used that cleaning method many times before, so I guess some filters are just not consistent in quality. Anyhow, I found your post interesting. how about marumi filter? Anyone tried it? My thoughts on the subject have not changed as well. Hot sure if this thread is still being followed. I did a search on B&H for a 5 stop ND filter in a 77 mm size. There were 11 options that came up, ranging in price from $63 to $282 for a Heliopan, a brand I’ve never heard of. B+W was NOT an option for this filter in this size. I’m not one that believes that quality and price go up and down in direct correlation to each other. But I also know that good quality does not come cheap. Nasim, have you looked beyond they B+W brand? What is the gain, if any, by spending the BIG bucks? Do I stick with Tiffen and Hoya, brands that I’ve been familiar with for decades, or do I look at high priced brands that I don’t know, like; Schneider, Singh-Ray or Heliopan? To be clear, I’m too stinking cheap to pay more than I need to, and too stinking fussy to settle for anything that will detract from the quality of the final product. Who has good experience to share with me? The Hoya are surprisingly good and I normally have a Hoya multi coated UV filter on most of my lens. In a few instances I was able to find a B+W at a discount price so I have a few of those as well. There are a couple of web sites that have done tests on filters, Hoya was often at the top or near the top of the list. From the other side of the coin. This test (clearly?) shows that you need stack FOUR layers of low grade filter in order to be able to demonstrate its weakness. I wanted to buy b+w filters after reading your post, but I was looking for square ones, and b+w don’t seem to do any. Do you know of any good quality brands that do square filters?